The security industry is booming globally. In the international strive for global peace and stability, governments depend more and more on private contractors to ensure their foreign policy goals are met. However, oftentimes foreign security forces are not welcomed abroad because they are enforcing foreign governments’ policy tasks. Think of the incident known as Black Hawk Down in 1993, where an American soldier was dragged through the streets of Mogadishu, Somalia after a US Army helicopter was shot down by Somalis. This caused US citizens to demand the discontinuation of employing American ground troops. Consequently, anti-terror interventions in dangerous or hot zones were increasingly outsourced by government to Private Military and Security Companies (PMSCs), who are luring their employees with lucrative bonuses and relatively low entry requirements. In this article I want to underline the need to take a closer look at this flourishing industry by presenting specific case examples that show the downsides of privatizing security. 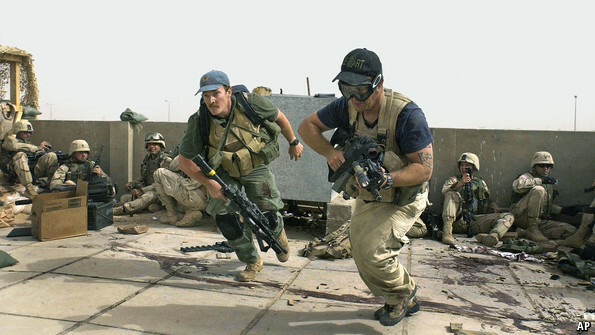 After all, the bodies of four American security men working for the private military company Blackwater were beaten, burned, and then dragged through the streets and hung over a bridge in Fallujah, Iraq, in 2004, indicating that the privatization of the military did not lead to a cooling of conflicts or more security in these danger zones. Complementing this report, the company’s corporate website states: “The Bancroft model contrasts with current conventional development or humanitarian efforts, which are often perversely incentivized: continued funding typically depends on prolonged conflict and worsening human misery.“ If you have never thought about development or humanitarian work in this way before, this statement may sound appalling. However, if this paradox is true, it establishes the first major concern about the privatization of security: the sector booms as long as there is insecurity – real or perceived. Considering for a moment that Bancroft’s strategy differs from other efforts in Somalia, let us look at Bancroft’s corporate model. Interestingly, Bancroft consists of two separate entities. Firstly, there is Bancroft Global Development, which is a non-profit private military security firm contracted by the US government and UN funded for peacekeeping operations in Somalia under AMISOM. The strings between development and security are being presented far more transparently compared to other private security businesses, as Bancroft uses the words development and security interchangeably. Secondly, Bancroft Global Investment is a for-profit investment company capitalizing on the success of their development work by building facilities in (transitioning) danger zones. This way, Bancroft can benefit from its efforts in Somalia in the insecure present and in the (more) secure future. However, evaluating profits in the future when, prospectively, Somalia is a secure and peaceful place characterized by a thriving economy, with a competitive real estate market, would not seem as lucrative for a strategist at Bancroft like Michael Stock. A quick cost-benefit analysis would suggest that Mr. Stock makes more money in a transitioning yet insecure Somalia, since Bancroft not only gets funding as a private contractor of the US government, but also cashes in on hosting aid workers, diplomats, journalists and UN peace-keepers in its private properties. Hence, from an economic point of view, this implies that PMSCs would choose securing profits over securing populations. Speculations aside, this leads to the next problem concerning the PMSC industry stemming from the fact that PMSCs are not yet under major scrutiny and do not have to adhere to binding legal frameworks. Security companies can basically operate on a global scale without facing major consequences in case of misconduct. This has led to a multitude of ethically repugnant incidents in the last 20 years. The private military company Blackwater was one of the main contractors operating in Iraq for the US government to fight terrorism. On 16 September 2007 Blackwater employees shot Iraqi civilians at Nisour Square in Baghdad. Extensive reporting on the Blackwater scandal by the New York Times can be summarized as follows: The Iraqi government and state prosecutors plead the Blackwater guards 100% guilty of manslaughter. On the US side, however, Blackwater lawyers referred to the immunity of security contractors according to civil law. While the US government finally lifted their immunity so that the Iraqi government could proceed with their prosecution, the American entrepreneur Erik Prince, founder of Blackwater, re-named the company to Xe in order to keep operating in Iraq. Today, after 10 years of trials, the accused Blackwater employees have still not been convicted. Another private security firm that has been in the news repeatedly is G4S, based in the UK. The Guardian for example, reported multiple abuses by G4S personnel at immigration centers and prisons and even the death of Angolan refugee Jimmy Mubenga on his deportation flight. Other frightening examples come from Germany, where security forces have been accused of forcing refugees into prostitution and beating residents at refugee homes. Low job requirements and shortage of manpower are said to be the driving forces behind “discrimination, violence and the abuse of power” in these cases (source in German). These and other scandals should be alarming. “The humanitarian need to address the phenomenon of PMSCs stems from their presence and role in today’s armed conflicts.” (ICRC, August 2009: 38). With the International Code of Conduct Association (ICoCA), another attempt was made based on the guidelines outlined in the Montreux documents. The ICoCA gives away certifications for members who comply with the Montreux guidelines. Their members list is not that long yet, but it already comprises Academi, which is the successor of Blackwater or Xe, respectively. Still, being a member does not mean that a company is also ICoCA certified. Actually, only very few members of the ICoCA are certified, which leaves a lot of room for further promoting the ICoCA, as the UN already does. Moreover, it is unclear what happens to companies in case of non-compliance. To summarize, the sector remains lucrative because no one else wants to do the job. At the same time, appropriate binding legal frameworks for PMSCs and relevant education for PMSC employees still leave much to be desired, making dangerous environments even more dangerous. There is a major worry that the privatization of security goes hand in hand with aiming at profits rather than providing people with the basic human need for security. This development further causes intensifying conflicts globally. Hence, the legitimacy of PMSCs altogether has to be questioned.